Port Dickson, Malaysia: The Malaysian Army's (Tentera Darat) new FNSS Pars AV-8 8x8 infantry carrier vehicle was spotted in Bandar Tentera Darat - Army Town - in Port Dickson this afternoon. 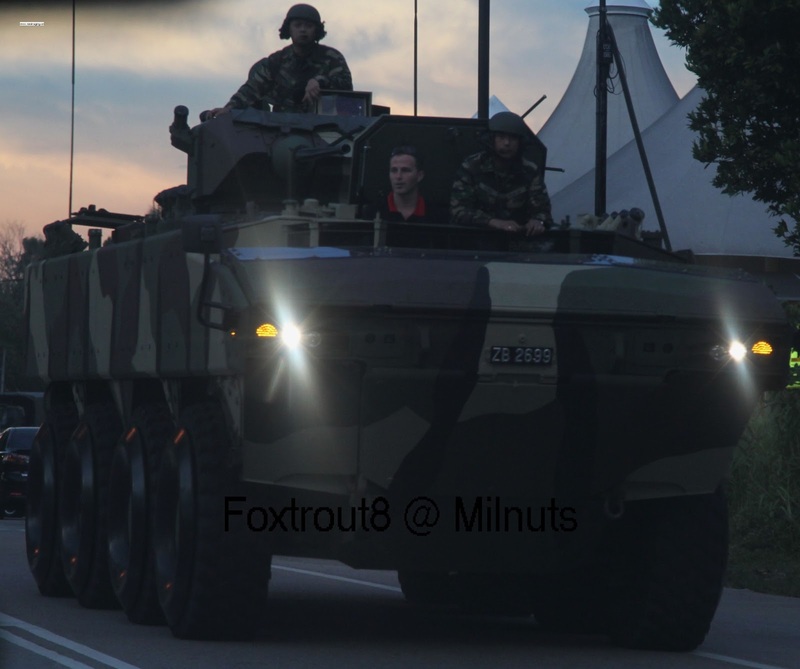 Here's a first picture of the Malaysian Army's new pride and joy, courtesy of Singaporean NSman "Foxtrout8". An AV-8 with Malaysian Army numberplate ZB 2699 which emerged from 2 Armor's Kem Sungala, off Jalan Pantai (Beach Road), was observed and photographed by Singaporean military buffs who happened to be in the area. ZB 2699 is fitted with a South African made Denel 30mm two-person a one-person 25mm turret for trials in Malaysia., which is one of several armament options for the 8x8. It was interesting to note that ZB 2699 was driven open hatch by a foreign talent (see picture above), quite possibly a staff of armoured vehicle maker FNSS. The t roop compartment hatches were open during the transit around Port Dickson. This indicates that the AV-8 may have arrived recently in the Malaysian Federation from its Turkish maker, FNSS. The practice of displaying a new war machine before it turns fully operational is different from that of the Singapore Armed Forces (SAF), which prefers low-key introductions of military capabilities. New SAF war machines are typically unveiled only after they have attained initial operational capability, which indicates that the forces who use the weapon platform or system are proficient in using it. The Malaysian 8x8 will make its debut on Saturday morning when the Malaysian Army will hold a parade and mobile column. The show of force is part of activities to mark the Army's 80 Anniversary. The Malaysian Chief of Army is due to hold a press conference after the parade to update the media and bloggers on developments in Malaysia's ground forces. Pictures of ZB 2699 at the parade will follow soon. Remember to eFile with IRAS today to fund the purchase of new toys! Malaysia like to suka suka follow. But piecemeal purchasing means they lack critical numbers.Sourcing for spares and support always seems to be a problem. Wonder how many of these machines they bought. Enough lah. One can carry a lot of durian already. Maybe even a couple of Nangkas dah deh.